Are your Photo Booths easy to use? Yes. All your guests have to do is step in the booth, choose colored or B&W pictures from our touchscreen, and pose! Our systems will handle the rest! Our Booth is approximately 5’W x 5’W x 7’H. The only other optional space needed is for two 6ft tables for the props and scrapbook. Do you need electricity for the equipment? Yes. We will need one outlet for our equipment. We will supply extension cords if needed. Yes. There are no steps, so guests in wheelchairs can use the booth. How long does it take you to set up the booth and equipment? We typically arrive one hour before the event just to make sure everything runs smoothly. What if something goes wrong with the computer, camera or printer? We know our equipment inside and out should any issue arise, we will work quickly to resolve any issues that come up. We serve the southern parts of New Jersey, Philadelphia Metro area and parts of Delaware and Maryland. We will travel farther, travels rates may apply. My event is upstairs/downstairs. Is this OK? Yes. Our Booth is set up on site and all equipment can be easily brought upstairs or downstairs. Can we have the Booth set up for an outdoor event? Yes. The Booth can be used either indoors or outdoors, weather permitting. My event has a color scheme. Can you incorporate it into the Booth? Yes. Use the #OurBooth link to look at our different background colors, we also can use a green screen to have any image you want! Don't see a color you want? Let us know and we will add your color to our collection! How many people fit inside the Photo Booth? We can fit up to 10 adults in our booth! Can pictures be printed in color or black and white? Yes. 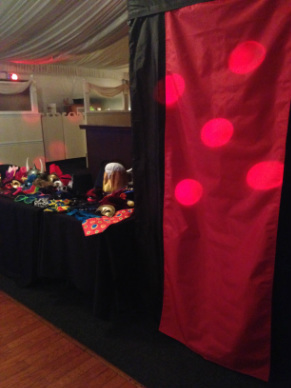 Unlike other photo booth companies, your guests can choose between colored or B&W. How long does it take to print my photos? Your photos will be printed and ready for your guests to take with them in about 10-15econds. Can I choose a different layout other than the standard photo strips? Yes. You can choose the popular 2"x6" photo strip or one of 6"x4" layout options. Do you offer props for guests? Yes. Unlike other companies, we don't charge for the use of our props! Having a theme party? Just let us know and we can incorporate it into our props! Can I choose the captions that will appear above the photos? Yes. We can add captions to the top and bottom of the photo strips. Is there a limit on how many times my guests can use the Photo Booth? No. Guests can use the Booth as often as they want during your rental period. Is travel time included in our rental time? Can I get a copy of the photos from the event? Yes. We can put everything on a flash drive or a CD at your request. This needs to be requested ahead of time. We accept Visa, MasterCard, Discover, checks, money orders, and cash. No. We are very up front with our rates. Yes. We require a 25% deposit at the time of booking to secure your event date. The balance is due 10 business days before your event. We will accept payment on the day of event only in the form of cash. What if my event is cancelled? Can I get my money back? Yes. We will refund 100% of your deposit as long as you cancel your reservation at least 15 days before the date of your event or if the reason for cancellation is beyond your control.